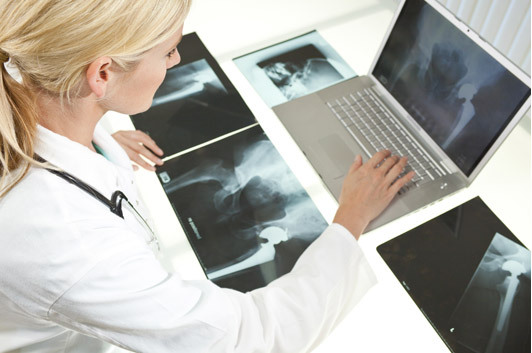 At Cheltenham Hip Clinic, we treat a wide range of hip conditions. It’s important to note that not all hip problems require surgery and we will always look for a non-surgical solution where possible. However, should you require surgery, the information below aims to address some of the concerns you may understandably have. Total hip replacements are one of the most reliable and cost-effective operations available today and can dramatically improve a person’s quality of life by reducing pain and improving mobility. As with any operation, though, there are certain risks associated with surgery and it is important to be aware of these before going ahead. We’ve outlined some of the main risks below. Don’t worry, though, all this will be discussed fully with you before your operation and there’s plenty of time to ask any questions you might have. Today’s anaesthetics are very safe. The anaesthetist will talk to you about the type of anaesthetic that is best for you and any associated risks. There are also the general risks of surgery, including heart and lung problems, but these are uncommon. A common way to provide anaesthesia is to give an injection into the base of the spine which makes the legs go to sleep for four to six hours. This is used in conjunction with sedation so you will effectively be asleep during the operation. Despite the strictest precautions, there is always a small risk of infection. We do everything we can to reduce the risk of infections at all stages. All patients are screened for MRSA prior to admission to the ward and all patients receive antibiotics just before surgery. We also take numerous strict measures to prevent infection during the operation. Should an infection occur, a superficial infection can usually be treated with antibiotics. Should the infection be around the new hip joint itself, a further operation would be required to wash out the joint. In a very small number of cases (approx. 1%), a deep infection would require revision of the hip replacement and re-insertion of a new hip joint when the infection has been cleared. Any ball and socket joint can dislocate and we take all the steps we can to reduce the risk of this in surgery. You’ll also be given clear guidance from your physiotherapist and surgeon about what you can do to avoid dislocation. The vast majority of people do not dislocate their hip after surgery and only a very small number of people’s hips dislocate more than once. In extreme cases, revision surgery may be required. Did you know that very few people’s legs are exactly the same length? In fact, by the time you require a hip replacement it’s common for your leg on the affected side to be several millimetres shorter as cartilage is worn away in the hip. It is possible to lengthen a leg through an operation but it is not possible to shorten the leg. Occasionally the patient’s leg may feel longer after their operation and it is not uncommon to experience back pain for several weeks as you start to walk more upright again. This usually settles down quite quickly. There are important nerves and blood vessels which run around the hip. Mr Mutimer, surgeon at Cheltenham Hip Clinic, performs a posterior approach to the hip and as a routine part of the operation he identifies the nerve and protects it during the operation. There is a very small risk of the nerve being stretched or damaged during the operation but this is extremely unusual and the risk is less than 1%. We take blood clots extremely seriously. Due to the nature of the operation, patients are at risk of blood clots forming in the veins in the lower legs. A blood clot in the calf veins themselves (known as a deep vein thrombosis) is not usually a problem, although this can be much more serious if the blood clot detaches and moves to the lung (pulmonary embolus). The rate of occurrence of a pulmonary embolus is quoted at 3 per 1,000 patients but the real figure is probably lower than this as patients are up and about much quicker these days. We are very proactive about preventing blood clots, including carrying out regular testing for blood clot risks and using blood thinning agents. If patients do develop a blood clot, they are treated with a blood thinning agent called Warfarin. The latest techniques used in total hip replacement surgery mean that a hip replacement should last a long time. Current studies indicate that 90% of hip replacements that are performed now should last 10 years. However, hip replacements can wear out and become loose, meaning that revision surgery is required. This is usually a bigger procedure than the original hip replacement surgery but similar risks apply. Ceramic articulating surfaces are appropriate for some patients. There is a very small occurrence of squeaking of these bearings but it is actually quite rare. There are also reports of ceramic fracture but these are extremely rare and run at less than 1 in 10,000 hip replacements. Other bearing options include metal on polyethylene, which has extremely reliable and hardwearing results. There has been a lot of press coverage about metal-on-metal hip replacements. Mr Mutimer does not offer these operations due to concerns regarding their early failure. You can contact us via your GP, phone or email. Simply fill in your details here and we will get back to you to find an appointment that suits you. Mr Mutimer is an orthopaedic surgeon with a wealth of experience. He is supported by a talented multidisciplinary team of nurses, physiotherapists and theatre staff, at Nuffield Health and Linton House, as well as by his experienced and knowledgeable personal secretary, Clare Bryant.